As if Chris and Liam Hemsworth weren't enough, Luke Hemsworth's breakout role on Westworld has given us another Hemsworth brother to love. This family is the gift that just keeps on giving, and I predict he'll be a household name in no time. Although he made a brief cameo alongside Liam when Chris hosted Saturday Night Live last year, Hemsworth's onscreen work has mainly been in Australia until now. But, his performance on Westworld will undoubtedly open many doors for him in America and it looks like there's a new Hemsworth heartthrob in town. 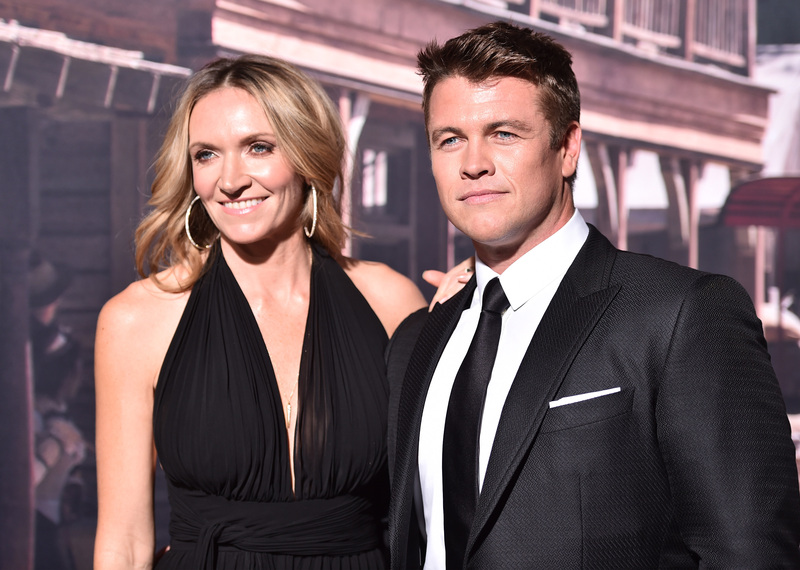 I'm sad to report that he's taken, but who is Luke Hemsworth's wife? Luke himself hasn't received much press until recently, so there aren't a whole lot of details available about his wife, Samantha, who he married in 2007. But one thing is clear — he's a family man through and through. The couple has four children under the age of six and he frequently posts adorable family photos of his wife and kids on Instagram. But, Luke isn't the only partner on Instagram — and Samantha's account provides great photos and some fun facts about the actor's better half. When she takes her kids on outings, Samantha's not afraid to accessorize appropriately for the occasion. In August, Samantha celebrated her birthday with a whole lot of gold and glitter. Attendees included Liam, Miley Cyrus, and Wayne Coyne (lead singer of the Flaming Lips). Traveling the world is definitely a perk of Luke's acting career, but Samantha knows there's no place like home — and this home looks pretty fabulous. Samantha traveled back to Australia to attend Splendour in the Grass, an annual three-day music festival with a stellar lineup of indie rock, alternative, and hip hop artists. Samantha thinks she needs practice, but I respectfully disagree — the decorations are adorable and just looking at this photo makes me hungry. ...and her handstand is pretty darn impressive. Admittedly she may be a bit biased, but critics and viewers agree with Samantha that Westworld is absolutely amazing. She may not be a celebrity, but it's already pretty clear that Samantha Hemsworth is awesome — and surely no one would disagree that this family is beyond adorable.